Available now from Live Industrial , the Bel 180 semi-automatic, top and bottom uniform and random case tape sealer automatically adjusts for random case sizes during operation and can be locked into position for cases of a particular size to quickly seal a run of uniform cases. 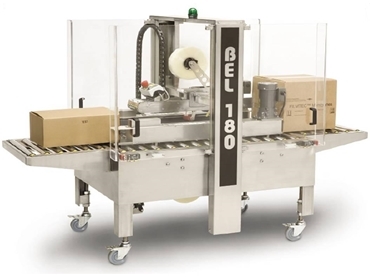 The Bel 180 semi-automatic case tape sealer tapes cases on both the top and bottom with either 2" or 3" wide tape using DEKKA stainless steel tape heads. top mounted conveyor belt and assembly parts are easily accessible and making changes and adjustments simple.